The Ring Road, also known as Highway 1 or Route 1, should certainly be on your bucket list! You will travel through stupendous scenery, see stunning geological formations, great volcano landscapes, and places with fascinating history. Traveling the Ring Road will offer you a mind-blowing vacation in Iceland! The Ring Road was chosen as one of the World’s Best Once-in-a-lifetime Journeys for 2018. Iceland’s famous Ring Road is the 1332-kilometer (828 mile) route which encircles Iceland, with the exception of the fjords in the West and North, and the Snæfellsnes and Reykjanes peninsulas. If you want to explore these areas, you need to travel a bit further. You will definitely want to visit some of the amazing fishing villages, peninsulas, and attractions which can be found right off the Ring Road. It is surprising how the distance adds up. You can expect to drive 1500 kilometers (1553 miles) minimum if you want to see Snæfellsness and the fjords in the North and the West. Speed Limit: 90 km/h (55 mph). 50 km/h (31 mph) in populated areas. Lanes: Two lanes in general, but there are some one-lane bridges. Maintenance: Maintained year-round, but occasional road closures can occur. Winter: 4X4 vehicles and experience driving in winter conditions required. Minimum Time to Complete: At least 6 days in summer or 12 days in winter. Ideal Time to Complete: 10-14 days in summer or 20-25 days in winter. Summer is the definitely best time to travel the Icelandic Ring Road. The most reasonable driving conditions can be found in June, July, and August. The roads can still be icy in May and September, particularly in the north and the east. In winter, which falls between October and April, the chances of safe road and visual conditions are much lower than in summer. When traveling such a long way around the entire island, it is pretty likely that you will run into challenging conditions somewhere along the way. Snowy or icy surfaces, snowstorms, strong winds, road closures, short daylight periods, and long bouts of darkness await winter drivers. If you are not comfortable or experienced at driving under such conditions, we highly recommend that you come in summer or join a guided Ring Road tour. 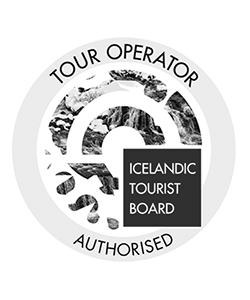 The local driver guides are trained to drive in the harsh Icelandic conditions and have a lot of experience doing so. In summer, you can travel the Ring Road in a regular or small car. You will not need a 4X4 or a Jeep. In winter, however, it is highly recommended to rent a 4X4 car, which will be safer in the challenging winter conditions. The Ring Road is under constant maintenance, but huge amounts of snow can fall in a matter of hours, especially in the northern part of the country. 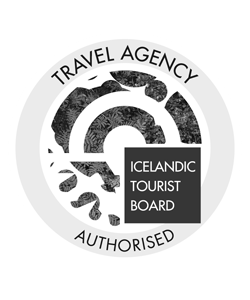 We recommend contracting full insurance for your car, regardless of which time of year you will be traveling in Iceland. The harsh and unfamiliar conditions can challenge even the most experienced drivers. Even if you are confident in your driving skills, you can never know how experienced the person that is driving the other car is. Strong gusts of wind and sandstorms can occur even in summer and can cause expensive damage to your car. That is why it is advisable to have a full insurance package, even in summer. When planning the time you will spend driving, remember that the maximum speed permitted anywhere is 90 kilometers (55 miles) per hour, in residential areas the limit can be as low as 30 kilometers (18 miles) to 20 kilometers (12 miles) per hour. You always need to consider the conditions as well. Sometimes traveling well below the speed limit will be necessary. Depending on where you are used to driving, you may find that the Icelandic roads in the countryside offer a different experience. The areas with the most spectacular mountain scenery also have dramatic twists, turns, and sometimes sheer drops. Speed limits in Iceland are clearly marked and should always be obeyed. There are unpaved parts of the Ring Road in East Iceland. The speed limit there is 80 km/h (50 mph), but you are advised to drive even slower if you do not have much experience on unpaved roads. All roads – even the unpaved mountain roads – are very clearly signed. Driving off-road is strictly forbidden in Iceland and is subject to very high fines. Even if you see tracks in the dirt, never go off the road and never follow the off-road tracks if they are not clearly signed! Driving off-road can cause serious, permanent damage to the Icelandic flora and landscape. It is also illegal and very dangerous to pull over on the side of the road where there is no designated resting place. Deadly accidents have happened when travelers pulled over to watch the Northern Lights or to check out a sheep or a reindeer. Even if the road seems empty, always find a place with a rest area to park your car safely and legally. There are plenty of gas stations along the Ring Road. Most of them are located in towns and there are a few stations in between in remote areas. Gas stations offer refreshments, snacks, and hot dogs. They sometimes offer basic groceries or more substantial meals as well. As for groceries, the best thing to do is to stock up in Reykjavík. In the capital, you will find the widest selection and the longest opening hours. The cheapest supermarket chains are Bónus, Krónan, and Nettó. Hagkaup stores might offer a somewhat higher quality selection but more expensive prices. In the larger towns, you will have your choice of cafés, restaurants, and supermarkets to stock up on provisions. In country areas, there are cafés, country restaurants, and sometimes hotels that offer meals to non-guests. Finding places to eat, to buy food, or to cater for yourself is not difficult. In the more remote areas – particularly between Egilsstaðir and Lake Mývatn – the distances between facilities is greater. If you stay at a farm, a country hotel, or a guesthouse, an evening meal can often be arranged. 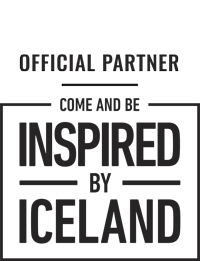 All stores, gas stations, hospitality, and catering facilities accept credit or debit cards. You basically do not need to have any cash with you in Iceland except perhaps a small amount, just in case. But, before heading to Iceland without cash, make sure that your bank will not block your foreign spending. It is also good to check your bank’s currency exchange rates and fees. As a European Economic Area (EEA) country, Iceland is part of the roaming-free area for citizens of the European Union. For the rest of travelers, it is a good idea to buy a prepaid Icelandic SIM card. Vodafone, Síminn, and NOVA are equally good with good network coverage around Route 1. You can buy SIM cards at the shopping malls in Reykjavík and at the larger gas stations around the Ring Road. Planning your overnight stays in advance is fairly essential if you want to stay in cheap guesthouses or hostels. Traveling with a tent or using a campervan, on the other hand, is fabulously flexible. There are camping areas all around the Ring Road. You do not need to book in advance at Icelandic campsites. They are inexpensive and you get to use their facilities. Campsites are plentiful in Iceland. Most open in May and close in September. A few campsites remain open year round to accommodate campervans. We do not recommend camping in Iceland in winter. 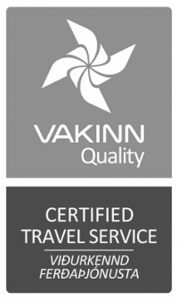 It is important to note that spending the night in a campervan, motorhome, or any type of vehicle outside of designated campsites is illegal in Iceland! The new law came into effect in 2017 after local authorities had had enough of beautiful Icelandic spots littered with food wrappers, toilet paper, or worse. For the same reason, camping in the wild with a tent is also forbidden along the entire south coast, and, basically, along the entire Ring Road. Remember, when traveling in Iceland, you should leave no trace and take all waste materials away with you. Always allow for the fact that the weather can change, causing your journey to take longer. Make sure that you have enough snacks and drinks for your group. One of the great things about the Ring Road is the opportunity to stop in unexpected places, so allow enough buffer time in your plan to visit extra attractions. Even in summer, storms and hazardous travel conditions can occur at any time. You will need to check out the weather forecast and travel information every day. When alerts are posted, it is really important to never ignore them. It is good to always have a Plan B in case you are facing hindering conditions. Fimmvörðuháls Pass: Starting out from the majestic Skógafoss waterfall, one of Iceland’s most thrilling hiking trails goes along a breathtaking canyon with countless waterfalls up to the highlands. The path weaves between glaciers and volcanoes into an otherworldly valley. Hiking the 25-kilometer (15.5 mile) trail usually takes 1-2 days, but you can always turn around and return to your car at Skógafoss after a 5-10 kilometer (3-6 mile) hike if you do not want to complete the entire challenging multi-day trek. Hiking on a glacier is something that you must do in Iceland if you want to explore the most unique Icelandic landscapes. You can hike on Mýrdálsjökul Glacier near Vík or Vatnajökull Glacier in Skaftafell. These glacier hikes vary in length and difficulty so you can choose the one that fits you best. Skaftafell Nature Reserve is a famous hiking area with an amazing network of well-maintained hiking trails. The most popular hike is the 5-kilometer (3 mile) loop to visit one of Iceland’s most unique waterfalls, Svartifoss. It is a relatively small, but very elegant cascade framed by insanely picturesque basalt columns. Skaftafell offers great hiking opportunities for all levels ranging from easy hikes to challenging, longer treks. The unique natural scenery around the possibly monster-occupied Lagarfljót Lake in East Iceland, along with Iceland’s largest forest, an absolutely unique arboretum, and the famously stunning Hengifoss and Litlanesfoss waterfalls offer some amazing hiking options which we highly recommend you try. The Borgarfjörður Eystri area in East Iceland has matchless natural beauty. The area features a dense network of well-marked hiking routes as well as some exemplary facilities for hikers. Ásbyrgi, the horseshoe-shaped canyon in North Iceland is a true gem for hikers. Its walls measure up to 100 meters (330 feet) in height while the whole canyon is approximately 3.5 kilometers (2 miles) long and over 1 kilometer (0.6 miles) wide. You can either walk along the top of the canyon walls or up to the distinctive rock formation that divides the canyon through the middle. Inside the canyon, a thick woodland of birch and willow creates a magical atmosphere for hikers. Another great option in North Iceland is to hike through the quite fresh lava field that is created by an eruption by the Krafla Volcano only two decades ago. The hiking trail starts in Reykjahlíð and goes through the rough lava terrain to the source where the lava is still steaming. It is, however, absolutely safe to walk on. Húsafell in West Iceland is a well-known hiking area among locals. A nice forest and a good network of hiking trails that lead to spectacular views await adventurous souls. A swimming pool, a large campground, summerhouses, and great facilities can be found here. One of Iceland’s most beautiful day hikes is located only 60 kilometers (37 miles) from Reykjavík. The exceptionally beautiful Glymur, Iceland’s second highest waterfall, will be the prize for those who hike this trail. It takes about 3-5 hours to explore completely. Esja Mountain, 20 kilometers (12 miles) from Reykjavík, is probably the most frequented hiking area in the country. Its well-maintained hiking trail network is perfect for families, runners, and mountain bikers as well. Dress in at least three layers and wear warm, comfortable clothes. Wear something that is completely waterproof and windproof as an outer layer. You will experience rain and wind almost every day. In winter, pay extra attention to your insulation layer. A warm, waterproof, and windproof down jacket will do you good in winter. Meanwhile, in summer, a raincoat, windproof softshell jacket, and a warm polar or knitted wool sweater is enough. It is important to wear comfortable, non-cotton, long-sleeved undergarments. Choose a good, fast-drying fabric (such as fine merino wool, for instance). Wear comfortable and waterproof boots. Leave your high-heeled boots and sneakers at home. Gloves, scarves, and hats are necessary in winter and may be necessary in summer as well. Having reusable pocket warmers in winter is a good idea. Do not forget your swimsuits! When traveling along the Ring Road, you will get to see a great variety of unique Icelandic landscapes. You will get the chance to explore the Land of Ice and Fire from all directions as you complete the full loop. Everyone who travels the Ring Road has a whole bucket list of must-visit places. Following are some of the spellbinding places which no visitor should miss. The landscape is incredibly varied along the entire Ring Road, but it is especially fascinating on the South Coast. If you decide to start your Ring Road trip on the southern coastline, you will first witness the volcanic foothills and moss-covered lava fields with steam rising up into the air near the town of Hveragerði. Soon, you will pass by wide coastal plains and lovely farms where Icelandic horses and sheep run freely. Leaving the meadows behind, the scenery will begin to change. Marvelously jagged mountains, sensational waterfalls, and hair-raising cliffs are lined up on one side while the endless ocean extends along the other side. You will drive past active volcanoes covered by thick glaciers. Traveling along the South Coast, you will drive past Europe’s largest glacier-national park with countless thrilling glacier tongues cascading from the ice caps to touch the ground. It is no wonder why South Iceland is the most visited part of the country. Seljalandsfoss Waterfall is the very unusual fall where you can walk behind the cascade in summer to admire the breathtaking view from behind the waterfall! The water drops 60 meters (197 feet) with intense power, making humans feel very tiny and weak compared to this majestic natural phenomenon. In good weather and visual conditions, you will able to see the infamous, 1651-meter (5,416 feet) tall Eyjafjallajökull glacier-volcano from the road. It is covered by a massive 100 km2 (62 sq. mile) glacier. Eyjafjallajökull erupted most recently in the spring of 2010, causing 800 people to be evacuated, and air travel severely disrupted across northwest Europe for six days. Just a short drive from Seljalandsfoss, another majestic waterfall comes into view. Skógafoss waterfall is 60 meters (197 feet) high and 25 meters (82 feet) wide. It is not possible to walk behind this one, but you can climb up to the top to enjoy the incredible panoramic view from there. Continuing towards the east, you will soon arrive at Iceland’s most famous black sand beach area. The beach is covered with pitch black volcanic sand and stretches over 5 kilometers (3 miles) between a scenic mountain and a group of spectacular cliffs and sea stacks, called Dýrhólaey. The famous Reynisfjara Beach is the highlight of this area. It has absolutely stunning basalt columns, hair-raising sea stacks, and even a columnar basalt cave. This is probably the reason why Reynisfjara has been ranked as one of the most beautiful beaches in the world. On the other side of the mountain sits a tiny, charming village, Vík. It has its own black sand beach with a stunning view over the Reynisdrangar sea stacks. With a small church on a hilltop covered in purple lupin meadows, Vík offers idyllic photo locations for Iceland enthusiasts. As we continue east, the landscape starts to change a lot. In good weather, you will probably see the Mýrdalsjökull Glacier under which rests one of Iceland’s most furious volcanoes, the notorious Katla. It has erupted violently every 80-100 years over the last thousand years, since the times of the Icelandic settlements. Katla has not erupted violently for 100 years, although there may have been small eruptions that did not break the ice cover. After driving through endless plains and desert-like areas caused by past and present glacial floods, you will soon arrive at Iceland’s most beautiful glacier wonderland, Skaftafell. This stunning valley between gigantic glacier tongues is a famously beautiful hiking area. Skaftafell is also the best place to go for a safe, guided glacier hike. The next natural wonders that will surely blow your mind are the famous Jökulsárlón Glacier Lagoon and the Diamond Beach. These unique sites offer otherworldly views of stunning icebergs as they drift across a lagoon towards the Atlantic Ocean. These wonderful icebergs of all shapes and sizes break off from the glacier as it retreats and floats into the lagoon. As they reach the ocean, the waves push them back onto the shore where they end up on the black sand. This thrilling environment is constantly changing and never looks the same. It is well worth taking a kayak or boat tour on the lagoon to get closer to these icy wonders as well as the main inhabitants of the lagoon, the seals. As you leave the southern coast and the Vatnajökull Glacier behind, you will soon arrive in a totally different landscape. The eastern region is beautifully varied and peaceful. After driving through desolate glacier flooding areas, arriving in the town of Höfn feels as if you are entering a metropolis. Höfn is often referred to as Iceland’s lobster capital, so make sure you stop for a taste. Driving east, you will soon pass by some oddly-shaped mountains. As these are among the most photographed mountains in Iceland, you will probably feel the urge to stop and take photos here. Continuing on your way, you will arrive in the east fjords area where you might be able to spot some wild reindeer. They are numerous in the east. If you have some extra time, take some detours to visit some lovely fjord villages. The “horny” mountains: Vestrahorn and Eystrahorn. The bay that is surrounded by these scenic mountains is an amazing playground for amateur and professional photographers as well. On calm days, the water mirrors the mountains perfectly. There are some adorable fishing villages along the coast on the road to Egilsstaðir. Djúpivogur and Seyðisfjörður are absolutely worth a visit. Seydisfjördður is also locally known as a bohemian “artists’ haven.” These are unusual, colorful, and amazingly idyllic places sitting in splendid fjord landscapes surrounded by gorgeous nature. Visiting some of these villages will take you off the Ring Road, but they are well worth a couple of hours’ detour! The town of Egilsstaðir is located on the shore of Lagarfljót Lake. The town is most famous for its surrounding landscape and for the favorable climate of the area. Lagarfljót is one of the longest lakes in Iceland at 53 kilometers (33 miles) long and 112 meters (367 feet) deep. It allegedly has its very own serpent monster which was even caught on film! On the southern shore of the lake, you will find Iceland’s largest forest. As there are not many trees in Iceland, this forest is a national treasure. If you visit Iceland in summer, Borgarfjörður Eystri is the absolute best spot to see the cute puffins up close and personal. Although it is an hour detour from the Ring Road, this region is truly a hidden gem and well worth the visit. 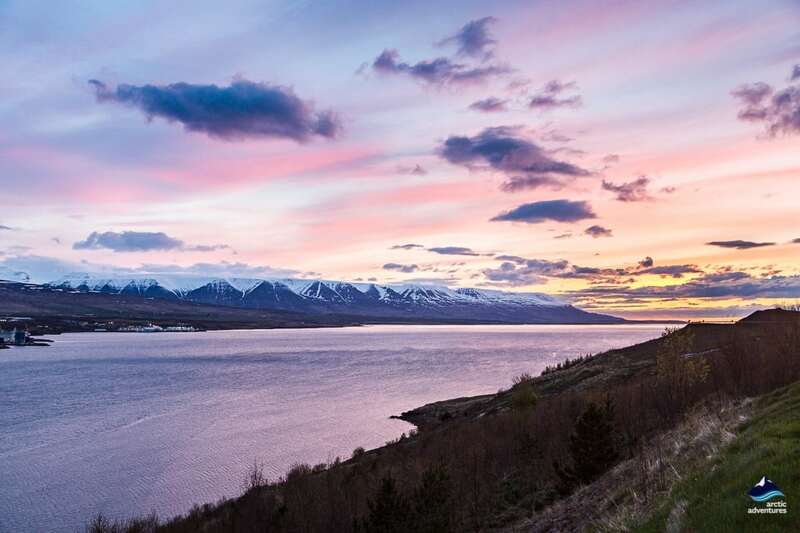 Locals know Borgarfjörður Eystri for its matchless natural beauty and amazing hiking trails. This place is also home to the Queen of Elves who is believed to live here in the beautiful Elves’ Castle! North Iceland is a wonderful region packed with some unmissable natural beauties. The landscape and atmosphere are entirely different from the rest of the country. Here the arctic characteristics are stronger. The area gets more snow, darkness, and Northern Lights in the winter than any other region in the country. North Iceland is full of contrasts. Active geothermal fields and dramatic volcanic landscapes, colorful villages, age-old turf houses, whale-filled bays, and some of Iceland’s best waterfalls are also found here. 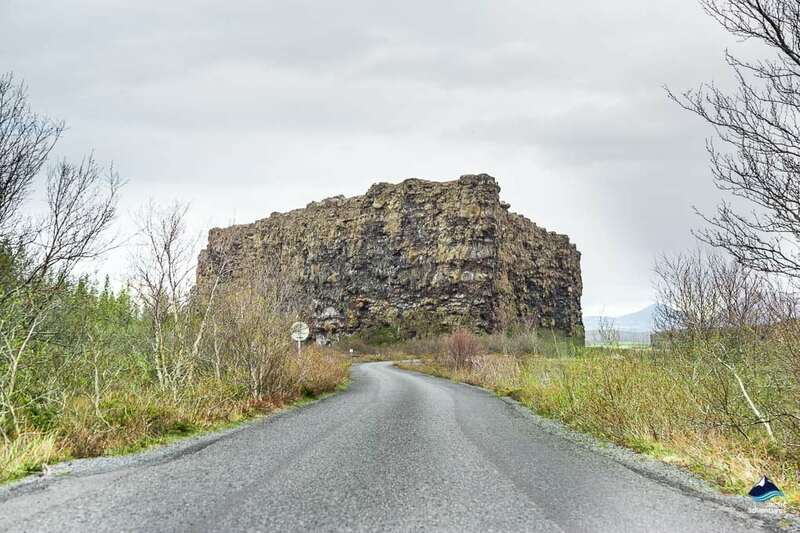 Ásbyrgi, a very rare geological formation and a magical forest-filled canyon will require quite the detour from the Ring Road, but it is well worth it. Ásbyrgi is a horseshoe-shaped canyon with its walls measuring up to 100 meters (330 feet) in height. The whole canyon is approximately 3.5 kilometers (2.17 miles) long and over 1 kilometer (0.6 miles) wide. It is divided through the middle by a distinctive, 25-meter (82 foot) high rock formation. A magical woodland of birch and willow offers an absolutely unique hiking opportunity. Another recommended detour from the Ring Road is Europe’s most powerful waterfall in terms of volume discharge with an average water flow of 193 m³/s (633 feet³/s). The Dettifoss fall is 100 meters (330 feet) wide with a 44-meter (144 foot) drop. Standing there and feeling the incredible power of the Earth is hard to describe in words! The Lake Mývatn region lies directly next to the Ring Road. The fourth largest lake in Iceland has countless tiny islands and is surrounded by enthralling volcanic scenery. The site is famous for its very interesting geological features, the so-called stratovolcanoes or Skútustaðagigar. They were formed approximately 2,300 years ago when fresh lava covered the wetland. The steam eruptions formed a number of picturesque, small craters. Massive lava eruptions occurred in the nearby Krafla Volcano multiple times during Iceland’s history. You will see fascinating lava rock sculptures, tunnels, and bridges in the Dimmuborgir lava park while steaming fumaroles and boiling hot springs can be found in the Námaskarð area. The beautiful Mývatn Nature Baths – often called the Blue Lagoon of the North – await visitors with its milky-blue, mineral-rich geothermal water. Exploring this alien scenery could be easily one of the highlights of your Ring Road tour! The stunning and historic waterfall, Goðafoss – the waterfall of the gods – is also located right next to Route 1. 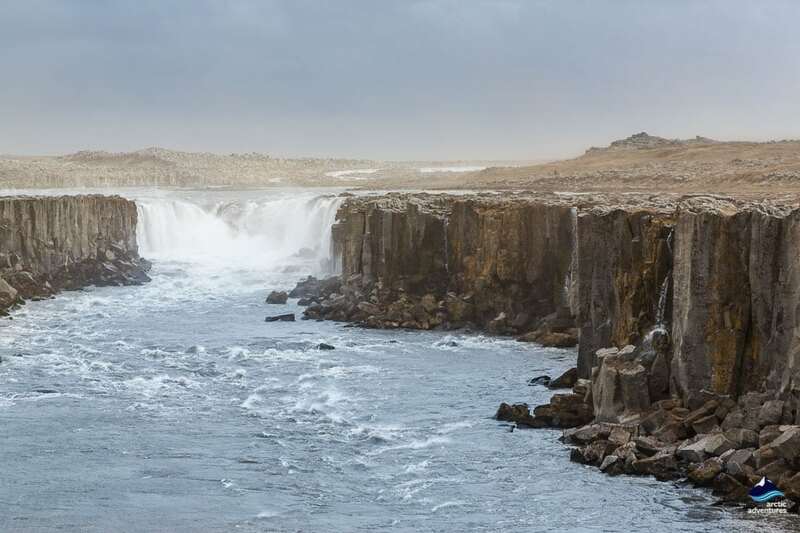 The waterfall’s name refers back to when Iceland switched from the Norse religion to Christianity. According to the legend, the person that made Christianity the official religion of Iceland threw his pagan statues into these falls. The water drops 12 meters (39 feet) over a width of 30 meters (38 feet), forming a crescent shape. No wonder Goðafoss is one of the most popular photo locations among visitors. Akureyri, the capital of the North lies next to the Ring Road as well. 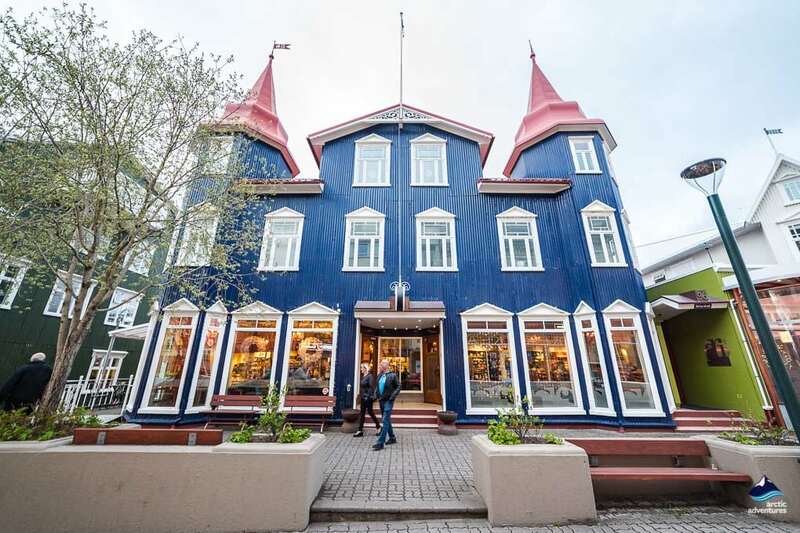 Even though it is a very small town with a population of fewer than 20 thousand people, downtown Akureyri has an amazingly vibrant atmosphere and rich culture. Dalvík Village and the Eyjafjörður Bay are just a short detour from the main road, but very a worthwhile one. 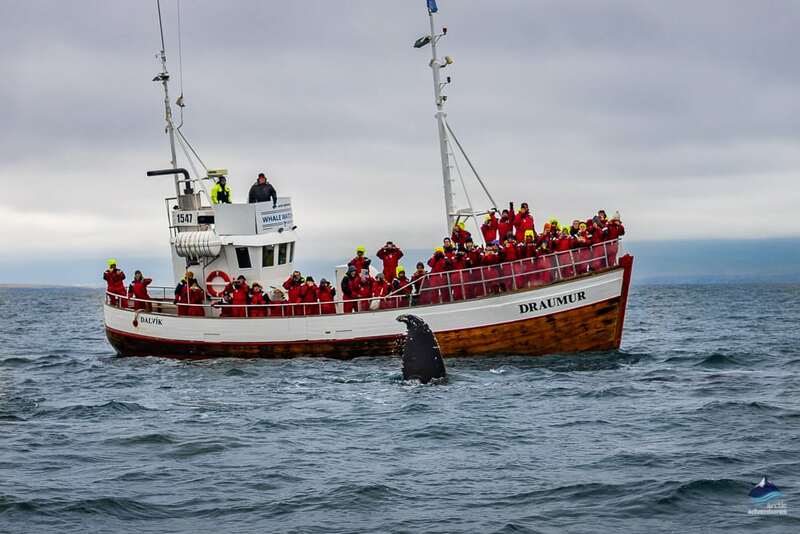 The fjord holds some of the highest success rates on whale watching tours in the whole country. Whales are abundant in the bay year round, but especially in summer. Generally, the success rate exceeds 95-99%, with anywhere from months up to half a year in a row with 100% success. If you would like to see an authentic Icelandic turf house farm, make sure you stop at the charming Glaumbær. The farm has 13 tiny, age-old houses that are made of layered turf blocks. Not only the roofs but all of the walls are beautifully grassy. The farm is believed to have stood here since 900 AD which is around the time when the first Vikings settled down on the island. Another short detour from the Ring Road is required if you want to see the totally unique rock formation called Hvítserkur. It is a 15-meter (49 foot) high sea stack whose shape resembles a giant animal – either a dragon or an elephant – as it drinks from the sea. The odd piece of rock stands among gorgeous natural scenery. West Iceland is mostly famous for its Golden Circle. This tourist route, however, is not located on the Ring Road but is a detour that we absolutely recommend. The Golden Circle features some of Iceland’s most frequented sites, such as the geysers, the gap between the tectonic plates, and a stunning waterfall. The western region offers plenty of amazing extra-day tour options. If you have time, try to visit as many as you can. You definitely will not regret it! On your way back to Reykjavík, you can stop for a refreshing hike up a scenic volcanic crater called Grábrók. It stands right next to the road and is very easy to access. The crater was formed approximately three thousand years ago along with two other picturesque craters and a seven square kilometer lava field. They all become visible once you climb Grábrók. There is a path leading up and around. Borgarfjörður in West Iceland offers a few amazing detour options. Deildartunguhver, Europe’s most powerful hot spring, is just a 15-minute detour from the Ring Road. This compelling hot spring produces 180 liters (47.5 gallons) of 97°C (206°F) water per second. This amount is enough to provide heating and hot water for the local communities within a 65-kilometer (40 mile) radius. 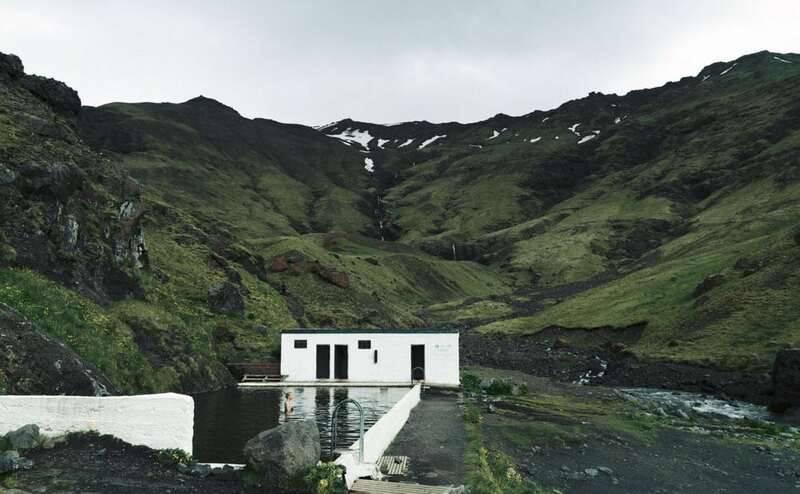 There is an open-air geothermal bath next to the hot spring, called Krauma Baths. It offers ultimate peace and luxury with a glorious view. From here, it is only a 30-minute drive to get to the very unique waterfall of Hraunfossar. The specialty of this particular fall is that its water comes out of the ground and ends up falling into the river that flows under the falls. This very special phenomenon lasts over 900 meters (984 yards). Another few kilometers from Hraunfossar is Húsafell, a fabled recreational area among locals. 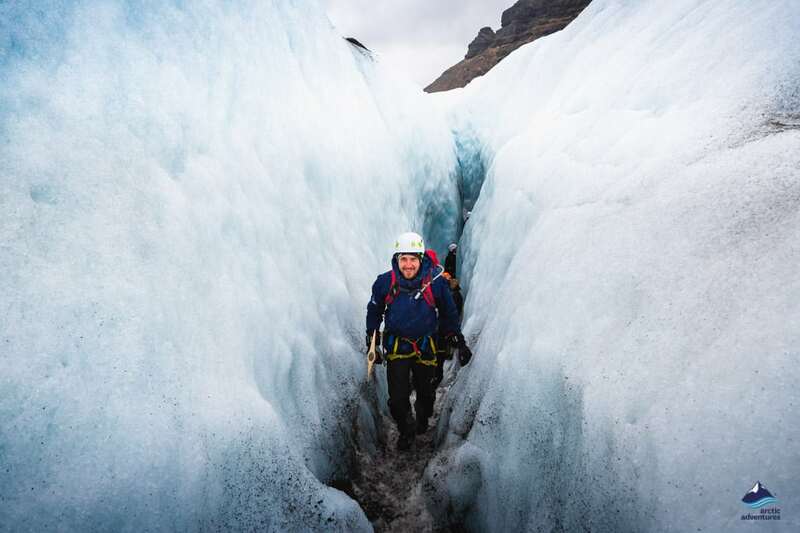 Here you can join a glacier or an ice cave tour on Iceland’s second-largest glacier, Lagjökull. The area is a gem which features a nice forest and good hiking trails that lead to spectacular views. A swimming pool, summerhouses, and great facilities await visitors here. As you approach the capital area, there is a tunnel you can take to shorten your trip. If you choose to skip the tunnel, however, and drive around Hvalfjörður, the whale fjord, you will definitely not be disappointed by the landscape. One of Iceland’s most beautiful day hikes starts at the tip of this fjord. It takes about 3 to 5 hours to explore Glymur, Iceland’s second-highest waterfall. The trail that takes you up to this 198-meter (649 foot) high fall is moderately difficult but outstandingly beautiful. Just before reaching the capital, you will drive by a beautiful mountain range called Esja. This is the scenic mountain that provides a breathtaking backdrop to the capital. 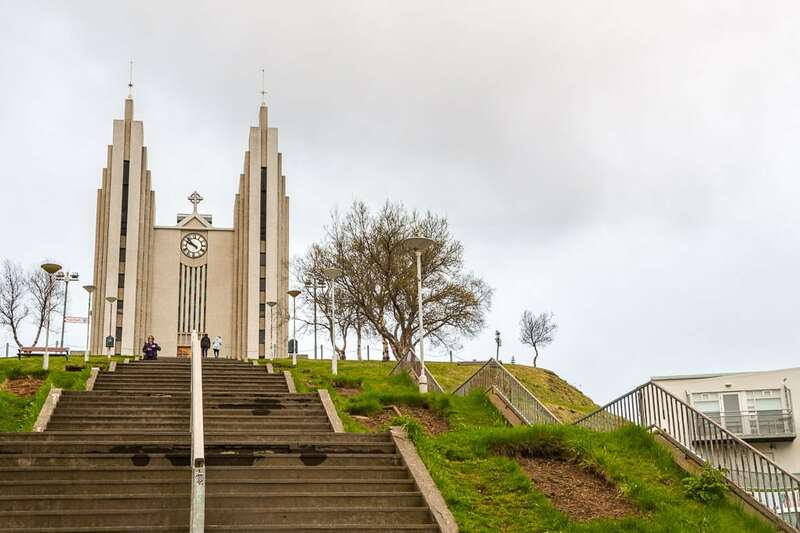 Thanks to its close proximity to Reykjavík, Esja is probably the most frequented hiking area in all of Iceland. Its well-maintained walking paths are ideal for family hikes, but runners and mountain bikers also love it. The highest point of Esja is 914 meters (2998 feet) above sea level. Climbing it is moderately challenging in summer and requires crampons in the winter. The view over Reykjavík from the top is just amazing! Does the Ring Road cover all of Iceland? No. The Ring Road is a 1332-kilometer (828 mile) long route which encircles Iceland with the exception of the fjords in the west and north and the two large peninsulas in the west and southwest. If you want to include those as well, you would need to add another 1200 kilometers (145 miles). Is the Ring Road the same as the Golden Circle, or is it included? No, it is not the same. The Ring Road does not include the Golden Circle Route. The Ring Road leads around the island while the Golden Circle is one-day round-trip from Reykjavík. The Golden Circle route consists of three main stops: Þingvellir (Thingvellir) National Park, the Geysir Geothermal Area, and Gullfoss Waterfall. All of these stops are located in the interior of the country while the Ring Road goes mainly around the coast of the island. Technically, the complete Ring Road can be driven in less than 24 hours without stopping. But, of course, we do not recommend that to anyone. With stops at the most beautiful natural highlights along the way, it takes approximately 6-7 days to complete the Ring Road in summer. This can, however, be doubled in winter due to the lack of daylight. If you want to travel comfortably and not spend too much time in the car, allow 10 to 14 days to complete the trip. The Ring Road is well-maintained all year round. There are unpaved parts in East Iceland, though. Even with the most careful upkeep, road closures can occur at any time. This is more common in winter (too much snow, storms, and blowing winds) but is not unusual in summer either (sands storms in Southeast Iceland, glacial floods, strong winds). What kind of car do I need to drive the Ring Road? You can travel the Ring Road in a regular or small car in summer. In winter, however, it is highly recommended to rent a 4X4 car which is safer in the challenging winter conditions. When is the best time to travel on the Ring Road? Summer (June, July, and August) is the best time to travel the Icelandic Ring Road. Summer offers good road conditions, endless daylight, and probably the most favorable weather conditions. This is up to you to decide! There is no wrong way. Whichever way you choose, the panorama is equally fascinating in both directions! Some museums around Iceland are very unusual, others are tiny, a few, especially considering their remote locations, are unexpectedly grand. Almost all reflect the colossal hard work and enthusiasm for life which are powerful characteristics of the Icelandic people. Discover the exciting museums around Iceland's main artery, the epic Ring Road!